Together, these changes build to "tipping points" - the point at which a series of small changes or incidents becomes significant enough to cause a larger, more important change. In this new blog series, we'll examine increasingly important trends that shape how we approach energy efficiency programs. In some areas of the Midwest, program administrators are already responding to these tipping points with new pilots and updated program designs. Other areas may be getting passed by, leaving valuable and cost-effective energy savings on the table. The good news is that these efforts have undeniably worked. According to the Pew Research Center, since 1970, per home average energy use has decreased 31% even while average home square footage increased 28%. 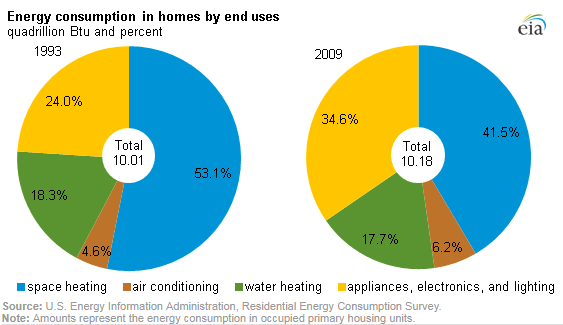 Likewise, the number of homes rose 80% over the same time period, but only consumed 45% more energy. It’s clear that as technology and society change and efficiency efforts bend curves, our aim needs to shift with our targets. Perhaps it’s past time to shift our program efforts toward this new half of the pie. Part of this will involve reinventing the same kinds of energy use standards that have been so successful to date. Similarly, there is likely a need for targeted incentives to help drive consumer behavior toward the most efficient devices. And of course, part of the solution may reside in harnessing some of the more advanced connected products to facilitate reducing energy use automatically or intelligently.